The IR-Pocket thermometer is a non-contact infrared thermometer. Simply aim at the target and press the measure button to display the surface temperature instantly. The IR-Pocket indicates temperature over the range of -49.9 to 349.9 °C with a resolution of 0.1 °C/°F (switchable). Each IR-Pocket thermometer incorporates maximum and minimum temperature functions together with an autopower off facility that automatically turns the instrument off after fifteen seconds, maximising battery life. 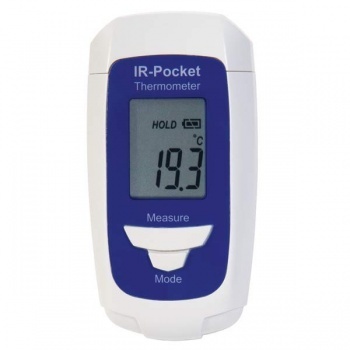 The IR-Pocket also features a lock function for continuous temperature measurement. The distance to target ratio is 1:1 and therefore the thermometer should be positioned as close to the target as possible. The default emissivity is 0.95 but can be changed from 0.1 to 1.